And yet, another guest blogger! Also know as The Palmwine Tapper, Frank is a really good friend of mine and trust me, one of the funniest people I know. He started a blog and everyone should please check it out, I'm always laughing uncontrollably at his witty posts. It's definitely my go to when I need some laughter during the day and honestly I could read one post more than once. It's quite lengthy but it really is worth the read! So joining guest bloggers like Onyi & Peace, I really hope you ENJOY Frank's piece as much as I did! Wow! Someone pinch me! I am writing on the Charmeleon blogger’s blog! Being on this blog is an honor as it was on my ‘’100-things-to-do-before-I-go-to-meet-my-creator-to-ask-why-He-gave-me-an-armpit-look-instead-of-a-Brad Pit-look’’ list. (Unfair!) It states clearly on my bucket list after No 45: ‘’Kiss Beyonce’’, ‘No 46: Write for the Chameleon blogger’. 1 down, 99 to go! Okay that should be enough rambling to settle my nerves, now to the matter at hand. You are probably thinking, ‘Oh why is the title the 10 commandments, is he going to preach to us?’ Keep Calm, curious Callistus! You shall find out in due time. Let me tell you a short story first. Just like every story, it was a beautiful sunny day and I was playing football. I was about 12 and had no worries apart from what color appropriate for painting the human drawings for my Fine art project, so I was a free child running around chasing every ball. Only if I saw it coming! While I was chasing the ball under the tree, I felt a sting on my neck. I clutched my neck hard and fell to the floor. I managed to get home and the next day surprisingly I was fine. I realized however I could do amazing stuff! I could sneeze so loud in front of a girl and she wouldn’t even flinch, she would just keep doing her thing. I could even do bungee jumping right in front of her nose and she would just be reading her novel casually. That lizard bite gave me superpowers. The Power to be invisible to girls! I digress.... now back to my cool tale.. So every super hero has a weak point for example Superman can catch an airplane like a Frisbee but acts like a wimp in the presence of a speck of Kryptonite. My own weak point was and still is the ‘the friend zone’. The power of invisibility disappears once I am in that zone and I become a mere mortal like you reading this post. So for me to have any sort of relationship (I mean your regular day to day interactions) with a girl I have to be in the friend zone. If I think of leaving that zone and taking anything a step further.. I would turn invisible again. Being in a friend zone(s) can be a great position sometimes. It allows you to view the Romeo and Juliet relationships from a great seat. It is a great because you are not in the thick of things but you are close enough to see almost everything. Chill I’m not sure if that makes sense but I hope you get my point, it is a great place for relationship analyses. 1. Thou shall be real and not be a Film-trick: If I received a pound for the number of times I have seen an Ekaette pretending to be a Kate, I would have bought a Bentley by now. Okay a toy one but that’s not the point! I don’t like it when ladies try to be what they are not. These days we have people pulling okrika British accent by day and bend-down-select American accents by night all in the name of pretending to be who they are not. You now have the ones that you take out for a meal and they want to eat one tiny salad. Oh sweet baby Jesus the son of the Holy Mary! If you had told me earlier you wanted grass what is the point of coming all the way here when we have a small garden at my backyard. I know some people are truly on diets and all and are trying to loose the pounds but the ones that just pretend and are so hungry that it would now be as if you are having a conversation with three people because her stomach keeps interrupting your conversation should stop it. However, this commandment does not mean you should eat everything on the menu either. Don’t be diabolic! 2. Thou shall not give one-word answers: For any males reading this, how many times have you been through this. Male: Hey what’s up? It’s been a while. How are you? Male: How was your day? I was walking to school today and got hit by a bus and a train at the same time, I just got out of 24-hour surgery and had about 89 stitches and I am alive, thank God. Do you know how annoying this is? To sprinkle salt on the already bleeding injury, they would now be the firsts to say they want interesting conversations. How would the conversations be interesting when you are volleying one-word replies to long lines? You can tell some girls a story worthy of being made into a 20th Century Fox movie and she would reply with ‘Kk’. 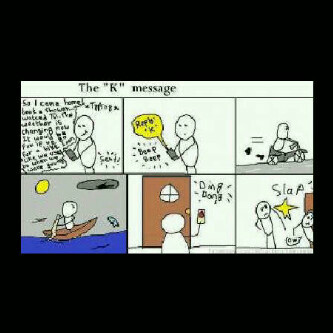 Don’t let God strike the ‘’k’’ key on your key pad please repent! 3. Thou shall respect the football time and keep it holy: Many of you fail to realize that, although the Bible says God rested on the 7th day of creation, God was probably playing FIFA or watching a Premier League match on that day. It would be really evil of any girl to deny a man (boyfriend, brother, father, security officer of your friend zone) his football time. That is just sacrilege! You just need to understand it is in the nature of most men to love football; it is just like the way Lesson teachers love to ask for ‘shilled’ water when they come to teach you at home. Don’t try and change what nature has ordained. 4. Thou shall not make unto thee any graven eyebrow: Eyebrows are probably the weirdest things in the world. They really do not do anything special but shave a bit off and you would end up looking like a rabies-infected bingo. I am a firm believer in leaving the eyebrows alone. You have enough hair on your head to play and fool around with. Leave the brows alone. But if you feel that you can do a better job than God and you decide to shave them off and draw your own. Please respect yourself and those who have the pleasure(?) of meeting you and do a good job. It is just simple Fine Art. The eyebrow is just a curve. If you need any help you can use French curves or broom stick. You can ask a friend to help you if drawing is not your forte. Do a good job is all we ask. 5. Thou shall not be an anti-cooking machine: This one makes me so angry that my anger can boil yam. There is something wrong and it makes me weep! Why would you be a woman and not have any interest at all in cooking? AT ALL!! I can hear some of you saying, but it is not by force. Hold it right there!! Imagine you are on a trip with your boyfriend or just a male friend and your car breaks down and it requires the tires to be changed. Let us be honest who do we expect to do that dirty work? Some girls don’t know how to change tyres, very understandable. Some girls don’t know how to boil rice, I slit my wrist! There are just subtle rules from the Universe, it is not written anywhere but they have to be followed to ensure things run smoothly. That is why the female Lions are the ones that go out to hunt (who remembers when Nala in Lion King was learning to hunt!). The ones that annoy me the most are the ones that clearly don’t know how to cook but would be influencing the ones that know how to cook and making them look at cooking like slavery. I am not saying be a cooking expert, but at least consider it as a useful skill to have. I am not saying you must cook for the boyfriend every single time, but don’t maintain the stance of not cooking because Friend X is forming I don’t cook for my boyfrien. I am afraid that this ‘’I am a Martian, I can’t be bothered to cook’’ attitude would be passed on to the next generation and we would reach a point where things like garri-turner would now be in museums and children would look at them as cricket bats their fore-fathers used. 6. Thou shall have a mind of your own: Moving in packs must be a trait evolution handed down to us as a result of various selection pressures, for security and all. Being lonely isn’t the best although it does pay to have some alone time. The problem is when the whole gang starts having one mind. Please and please you are not conjoined twins, triplets, quadruplets or whatever number is in your Clique. Even conjoined children think differently and have different moods and opinions. Ask some girls out on a date or whatever you lot go on and she would go and consult the oracles (the friends). Some of the friends would even be looking like oracles (going too far?). Have a mind of your own sometimes!! I’m not saying having friends and besties is wrong oh but learn to draw a line: Something like the one above. You just have to make some decisions yourself sister! One day some of you babes would use this attitude to chase away the angel bringing you blessings. I admit that sometimes we guys can come up and bring some ridiculous chat up lines at the worst times and places but not everyone is trying to chat you up. Sometimes he just wants to know the time or directions to a place. To be honest I think the main problem here is that people don’t really know the truth. Unfortunately, some of you think you are hotter than you are. You might be the finest girl in the room but we are in a geriatric ward honey. Let us all behave! In this time and age where every girl/woman calls you ‘honey’, ‘dear’, ‘hun’, ‘love’ et al, you would need to work on those your signs a bit more. Even the woman at the Tesco till always tells me, ‘’That’s 14.50 love.’’ and that woman must be getting muscles from pushing 70. We need better signs please. Get a billboard, do a batman light sign, anything! 9. Thou shall not take his favorite t-shirts as souvenirs: I actually got this commandment from a friend of mine as I haven’t being in such a situation and cannot relate. His girlfriend keeps taking his t-shirts from his wardrobe to wear back to her house anytime she visits him. He was complaining to me that she doesn’t even take the normal regular Primark ones, she goes to the drawer where he keeps the special fresh ones and just picks them easily like ripe mango. He is angry but he can’t vent because he feels the girl is too hot as he almost asked the girl if she was going out with him as one of her voluntary services to the community. He feels she is doing charity work. So he wanted me to add this to tell you girls to stop it. 10. Finally, Thou shall not turn thy face into a canvas: The way some girls slap makeup on their face one would think that they are going to a costume party. Why would you just decide to turn your face into a fine piece of abstract art? They would abuse the make-up and end up looking uglier than they started. That is just abuse of something that is meant to enhance beauty ma. Why would a very dark girl put pink blush on her cheeks? Please how is it possible for you to blush and turn pink? We all know it is not possible so there is no point of rubbing that one there. To be honest, these industries that make these cosmetics need to put a sign on their products telling the user to use in moderation. So dearly beloved, if you are a female apply these to your dealings with all men if you are male read this to your female companions. This way the world would be a better place for all of us. The Lord be with you brethren! Na wa for number 9 rule sha. That friend was/is really vexing. Funniest thing I have read in a while. He had me laughing like a crazy person at the office. Not cute. Miss you boo.